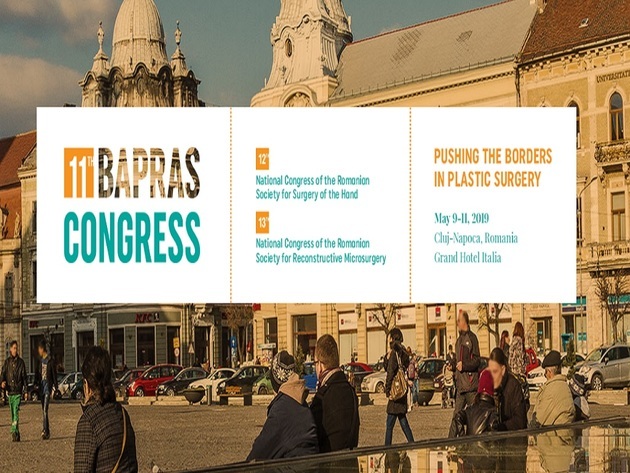 In the wish to continue the tradition of organizing very successfull congresses, the Romanian plastic surgeons, hand surgeons and microsurgeons are honored to invite all the plastic surgeons from the Balkan area, and also from all over the world, to attend the 11th BAPRAS (BASPRAS) Congress, which will be organized in Cluj Napoca, Romania, between May 9-11, 2019. Cluj Napoca – the capital of Transilvania with its already famous for the Dracula Castle – is nowadays the second biggest town in Romania, and is wellknown for its cultural richness and hospitality. The Program of the 11th Congress, under the title "Pushing the Borders in Plastic Surgery", clearly expresses this assumption: it deals with the accomplishment in the field of plastic surgery did by prominent European and World plastic surgeons. The program, including instructional courses, panels, conferences, free papers will cover all the fields of modern plastic surgery. We will try to bring together plastic surgeons with long standing experience, which will offer pearls of their wisdom and creativity to the young and enthusiastic colleagues.